Your Caltrain is at Capacity – Peninsula Moves! We recognize that Caltrain is crowded. We have the numbers to prove it and are currently looking for ways to provide more room, including trying to acquire additional rail cars. Until then, we have to take a more organic approach to making Caltrain service more comfortable for everyone. Besides common courtesy, logistical adjustments may be your best bet. That’s why we’ve put together a few key slides and statistics to help you make the best decisions to get where you need to go comfortably. It’s our goal to provide the most contented ridership experience possible. But demand continues to grow and with limited resources, providing additional capacity is a challenge. What Else Does This Affect? With the dramatic increase in ridership every delay impacts more riders than ever before. Every time a breakdown occurs the time and the logistical planning it takes to resolve the issues are compounded by standing-room-only ridership. 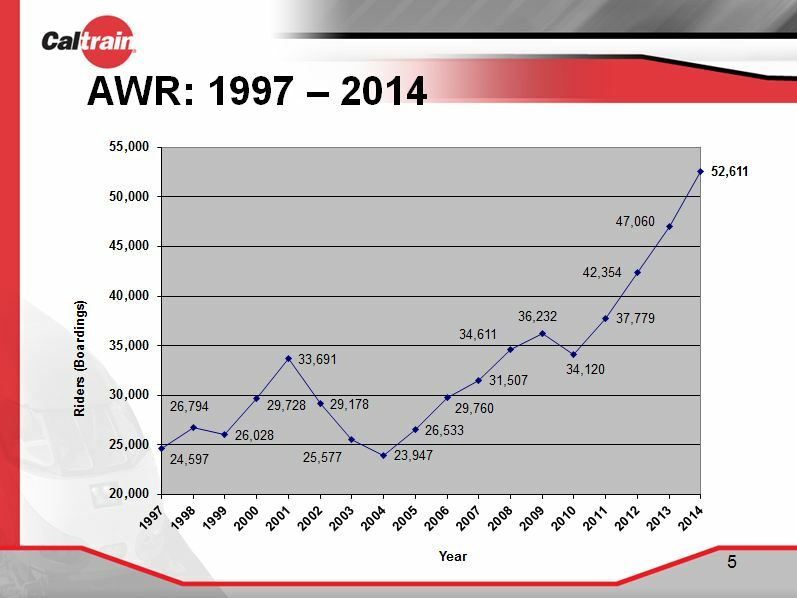 Additionally, there is more wear and tear on the aging passenger cars due to increased ridership. One example is that more doors are being held and forced open, resulting in more of the “door issues,” which cause delays and safety concerns. You can use our ridership data to see if you are among those passengers who can be flexible about which trains you ride. Obviously, not all passengers have that flexibility, but some do and there are options. Take a look at the most crowded northbound trains (HERE on page 6) and see if your usual train is on there. If so, can you take another train or even consider the SamTrans ECR ($2, every 15 minutes along El Camino Real). From Palo Alto to San Jose consider VTA 22 and 522. The capacity crunch impacts the bike car as well, where seating (bike space) is even tighter. It’s also good to know the differences between Gallery cars and the Bombardier cars, which have different bike capacities. If you don’t have a bike with you, please sit in a regular passenger car. Do you have to bring your bike on board? Can you use the Bay Area Bike Share program? For information about Caltrain and bikes: CLICK HERE. Stand clear of the train doors until all the departing passengers have gotten OFF the train, then board. Keep bags, belongings and feet off the seats so other passengers can sit. Please move as far into the car as possible; don’t block steps or the vestibule. Let bicyclists sit in the bike car. It’s important for them to keep line of sight on their bikes for safety concerns. 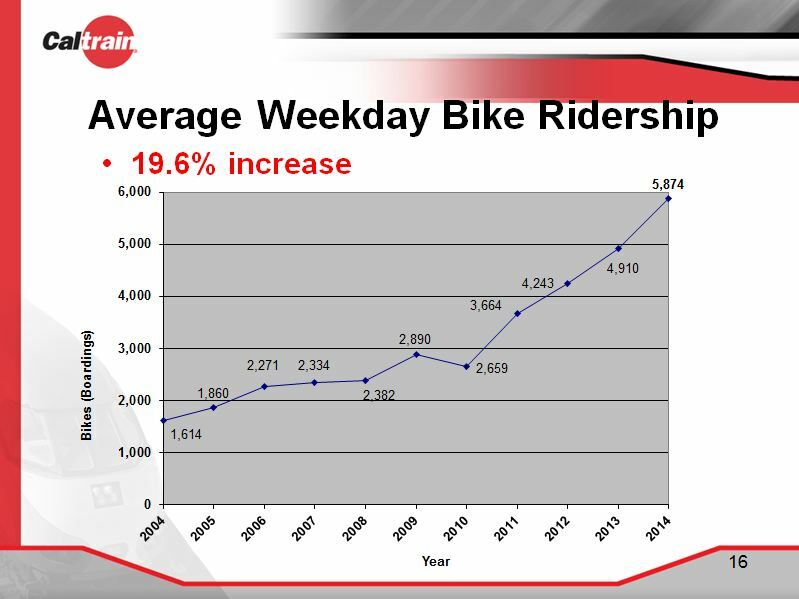 For more information about Caltrain ridership statistics: CLICK HERE. How about encourage standing upstairs when the train is full in the doorway/downstairs. Maybe if you wouldn’t have eliminated all samtrans express routes into San Francisco, you’d be finding some more room on the Trains from Redwood City. Can train can add more train after 9AM and 7PM where there are not enough express train? For example, train #233 (almost local SJ-Hilsdale) runs 100~120% of seating capacity. Additional train after peak period may not be a problem as there is available train-set and track capacity. I would like to see additional express train after #233 and #190. Express train departing 7PM or 8PM from SF looks very attractive. Of note, holders of Caltrain monthly passes that are 2 zones or more get free rides on SamsTrans and VTA local and light rail service, and VTA express service is discounted $2. So grabbing the SamsTrans ECR or VTA 22 would be free, and the VTA 522 would only cost $2.